Kalevala (the Finnish national epic). 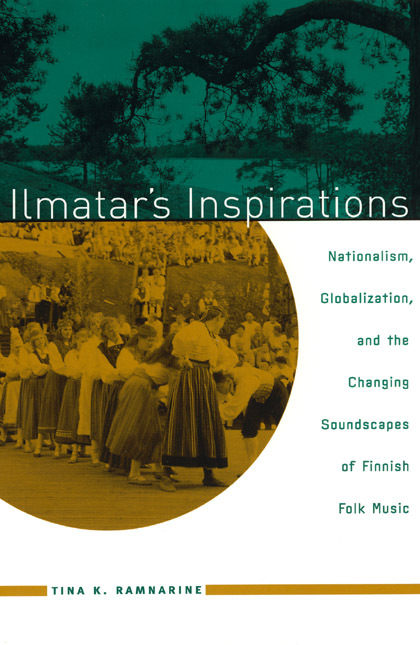 In Ilmatar’s Inspirations, Tina K. Ramnarine explores creative processes and the critical role that music has played in Finnish nationalism by focusing on Finnish "new folk music" in the shifting spaces between the national imagination and the global marketplace. Through extensive interviews and observations of performances, Ramnarine reveals how new folk musicians think and talk about past and present folk music practices, the role of folk music in the representation of national identity, and the interactions of Finnish folk musicians with performers from around the globe. She focuses especially on two internationally successful groups—JPP, a group that plays fiddle dance music, and Värttinä, an ensemble that highlights women’s vocal traditions. Analyzing the multilayered processes—musical, institutional, political, and commercial—that have shaped and are shaped by new folk music in Finland, Ramnarine gives us an entirely new understanding of the connections between music, place, and identity. Borrowing from the Traditions of "Others"
Chapter 3 - The Folk Music Revival in Finland: Toward "New Folk Music"
Chapter 8 - Musical and Social Identities: Borrowing from the Traditions of "Others"
"Ramnarine considers how Finnish folk music shapes national identity, the influence of outside musical cultures on Finnish folk music, folk music’s place in urban institutions . . . and the position of the individual folk musician in the growing arena of ’world music’. . . . Her study of this musical culture is thorough in its scope, dissolving the boundaries between urban and village, old and new, local and global, and professional and amateur. . . . . A detailed and informative look at some of Finland’s music festivals and most popular music groups." "An excellent ethnography of the ’new Finnish Folk music.’ Ramnarine has met key firgures of the movement, and I can well hear their intonations and personalities in the interviews. We learn how they conceptualize folk music and their own role as its practitioners, and get a good view of typical performance contexts." ’[Ramnarine] meaningfully connects changes in Finnish society and culture to changes in musical sound. . . .
Ilmatar’s Inspirations makes an important contrihution to the ethnomusicological and anthropological literature and comes highly recommended."